If you’ve ever marveled at the look of concentration on your baby’s face when she presses a button and a toy lights up or tries to fit a square block into a square hole, you know that playtime isn’t just about fun and games. It’s serious business — and toys are the tools of the trade. But shopping for the right plaything that promises to educate, as well as entertain, can be overwhelming — and expensive — with so many choices. Dr. Iris Castillo, a pediatrician at Akron Children’s Hospital Pediatrics in Ashland, offers a guide for the best toys for baby throughout her first year that not only thrill, but help her understand the world around her and stimulate a developing brain. Babies are constantly seeing, touching, smelling, hearing and tasting everything to learn about the interesting new world around them: Does an object feel hard or soft? Sticky or rough? What does it do if I drop it? Or put it in my mouth? Most play consists of “tasting” or mouthing an object and shaking, banging or dropping it. For the first few months, babies rely on their sight and hearing to soak it all in because they aren’t mobile yet. They tend to gravitate toward toys that are visually stimulating, such as those with bright primary colors and high-contrast patterns. In addition, they enjoy toys that make noise or light up. Crib mobiles entertain baby at this age, as well as rattles, teethers, cloth toys and musical ones. 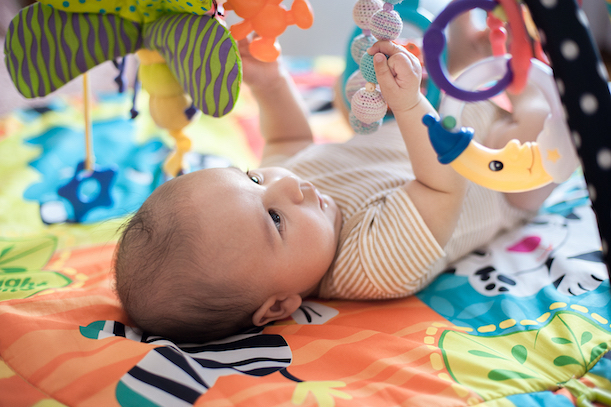 Once babies can reach and grab, activity play mats for tummy time are useful. Also, toys that are safe to test in their mouths are always a hit, such as keys on rings and other teethers. Textured toys that feel interesting or the crinkly fabric ones that make unique sounds are sure to thrill, as well. At 6 months, when babies start to sit up, toys that promote hand-eye coordination and gross motor skills become important. In addition, babies at this age love to bang and enjoy toys that have repetition. Nesting and stacking toys, activity cubes, shape sorters and pop-up toys are good for this age, as well. By 9 months, many babies may be crawling, “cruising” or even walking. To encourage large-muscle movement, try putting toys just out of reach to encourage movement, or try push or pull toys so babies can practice walking. To encourage exploration and fine motor skills, try giving her toys that have a cause and effect — for example, a toy with buttons that trigger different noises. Stacking rings, simple puzzles, blocks and rolling balls are all toys she may enjoy, too. Remember to always check the recommended ages for each toy and inspect them for sharp parts and other potential hazards, such as small pieces a child could choke on. Also, steer clear of older toys, even hand-me-downs from friends and family. They may not meet current safety standards and may be so worn from play that they can break and become hazardous.